A few weeks ago we bought a truckload full of split red and white oak from Noah's barber, whose cousin runs a tree business and sells the remains of dearly departed arbors on the cheap. That may be the most ridiculously Southern thing I've ever reported on this here website. Yeehaw! Be that as it may, you can't beat a huge surplus of already-seasoned firewood (in case you didn't know, wood has to sit for quite awhile once it's been split so the sap and moisture dries out), for just $100. I tell you, we've had some blazes worthy of the Yule Log Channel. The countless evenings of glowing fires we've enjoyed sitting on the hearth, Noah throwing another log on and shouting "Burn, baby, burn!" It's odd for a former city girl like me to feel comfortable wildly using resources such as ex-trees. Where I grew up, burning wood was a dangerous situation to be avoided according to Smokey the bear. And I only now just realized how odd it is to name the mascot for avoiding wildfires "Smokey." 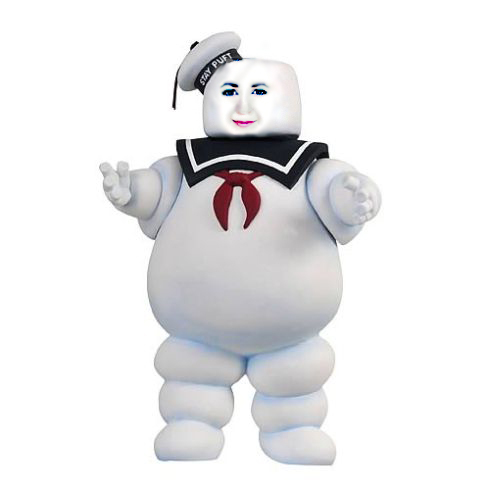 That's like making Stay Puft the official mascot of that insidious entity, the marshmallow industry. Anyway, I've been eating so many marshmallows my back teeth are starting to hurt whenever I even look at the bag of them, which is kept conveniently on the mantle piece. Incidentally, this year I'm observing Lent by giving up meat and sweets. So I've got to get rid of them somehow. It sounds like you train for Lent the way I do - by making sure your body is so full of the sweets you're giving up that you won't have a chance to go into withdrawal until mid-September. Mmmm...marshmallows. I haven't seen the industrial sized packs. Not sure I would love them. I'm of the set-the-'mallow-ablaze persuasion. Love me some charcoal, with a hint of gooey goodness in the middle. Lish—My goal is to have diabetes by Lent, to make it even easier. Amy—I have mixed feelings about them. The texture is decidedly different, because the middle gets all gooey and whatnot but the surface-char-to-volume ratio is definitely different.